This panda mobile brings a lazy touch of storybook style to your little one's nursery or playroom. Did you know that giant pandas spend twelve hours every day just hanging out eating bamboo? 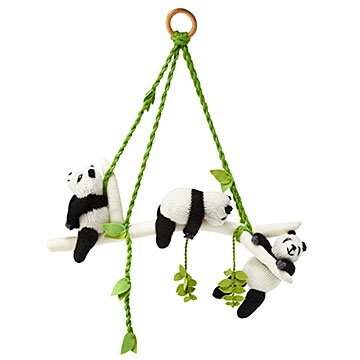 Featuring a group of adorable pandas, this mobile brings chill charm to your little one's nursery or playroom. Each cheerful, bamboo-loving figure is hand-knit from an alpaca, wool, and acrylic blend by artisans in Peru. Mobiles should be removed once child is old enough to push on to hands and knees. Always make sure to hang out of reach. Very well made! My daughter loves it! !